Hello! We made it to Wednesday! That's always a good thing to know you are halfway through the work week, or at least it is for me. This is a super busy time of year for me work-wise so I especially love relaxing with some crafting in the evening to unwind! 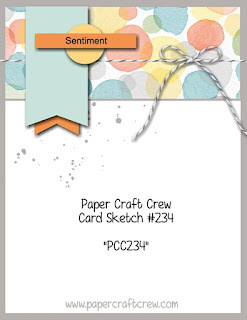 Well since it is Wednesday, it is of course, time for another Paper Craft Crew Challenge! So I have to be truthful.. at first I was not a fan of this sketch. But, as usual, once I started playing around with some ideas, it all came together and I think it is super cute now. 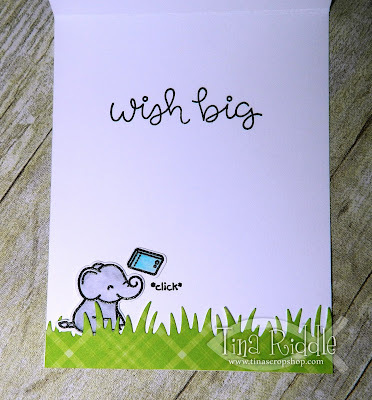 Oh and I was able to use my new Lawn Fawn Elphie Selfie Stamp and Die Sets so it was an added bonus! I think the animals in this set are just so so cute! For this one I started off with an 11" x 4 1/4" piece of Neenah Crest Solar #110 White Cardstock that was scored at 5 1/2" for a top folding card. Next I cut a 4 1/4" x 5 1/2" piece of Neenah Crest Solar #80 White Cardstock and used my Ink Blending Tool with Tim Holtz Broken China Distress Ink to blend in a sky. My Patterned Paper is from the new Lawn Fawn Perfectly Plaid 6x6" Paper stack. I cut a piece of the green plaid with a Lawn Fawn Grassy Border Die for the bottom of my card and a piece of multi-color plaid for the upper portion. The banners and circle were more of the same collection of paper. My images were all stamped on Bristol Smooth Cardstock with Versafine Black Ink and then Clear Embossed. I colored them in with Zig Clean Color Markers. 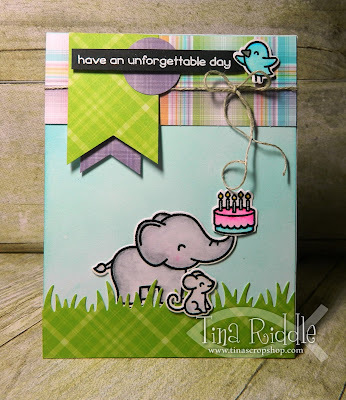 It is so easy to blend with the Zigs on Bristol Cardstock. The sentiment was stamped with Versamark onto a Black Cardstock strip and heat embossed with white embossing powder. I tied Natural twine on the upper strip of Patterned Paper prior to adding the banners. I used the edge of my scissors to add a little twirl to the twine. I added the 1" circle then the embossed sentiment strip. I added the bird to the side of the sentiment to look as though he is holding it. The large elephant was tucked into the grass with the cake on his trunk. I added the mouse over the grass so it would appear that he is standing next to my elephant. Such a darling little card. Love that elephant. Great use of pattern paper.